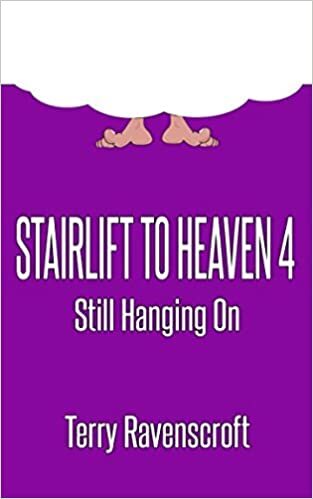 Review of Terry Ravenscroft’s Stairway to Heaven, Book 4, Still Hanging On. | Dragons Rule OK.
Review of Terry Ravenscroft’s Stairway to Heaven, Book 4, Still Hanging On. Yet another volume in the Stairlift to Heaven series. Terry Ravenscroft is still at it, accompanied by his faithful friend Atkins (although Atkins shows distinct signs of being unfaithful on at least one occasion). Similarly aged readers, and those approaching old age, will do well to heed the advice offered in these epistles. They will learn, amongst other things, how to deal with Men from the Orient who constantly plague you on the telephone, people who ring you up tell you there’s something that needs fixing on your computer if you don’t want your bank account to be emptied, General Election canvassers who arrive on your doorstep uninvited and unwanted, how to ensure that tarmac layers carry out their jobs in the manner promised and at the agreed price, and how definitely not to behave at a football match if you are seated amongst the opposition’s supporters. And lots, lots more. And, whilst doing all this, have a bit of FUN. I have recently finished reading Book 4 of Terry Ravenscroft’s Stairway to Heaven books. He has been writing these autobiographical books about his life and escapades for a while now, and they are very funny. Terry Ravenscroft was, until he retired, a scriptwriter for many well known TV comedians and sit-coms, including such names as Les Dawson, the Two Ronnies, Morcambe and Wise and Ken Dodd as well as Alas Smith and Jones, Not the 9o’Clock News, The News Hudlines and many others. Terry relates his escapades with his friend, Atkins, as well as tells of some letters he wrote to various pompous organisations. From trying to get Atkin’s neighbour, who has designs on him, to desist from her advances, to an incident with a letter Atkins wrote to David Beckham and Terry replied in Beckham’s place, we are kept laughing throughout the book. I do not want to spoil it for anyone wanting to read it by saying too much of the events and escapades this book covers. Just let me say it is very funny and well worth a read. This entry was posted in book reviews, entertainment, writing and tagged blogging, books, writing by V.M.Sang. Bookmark the permalink.